The classic shape of this ladies' leather watch will add a sophisticated touch to your wardrobe, whilst the Radley dog rose gold tone charm and contrasting silver tone case adds an element of fun to your look. Opt for wearing timeless hues with this black leather design. 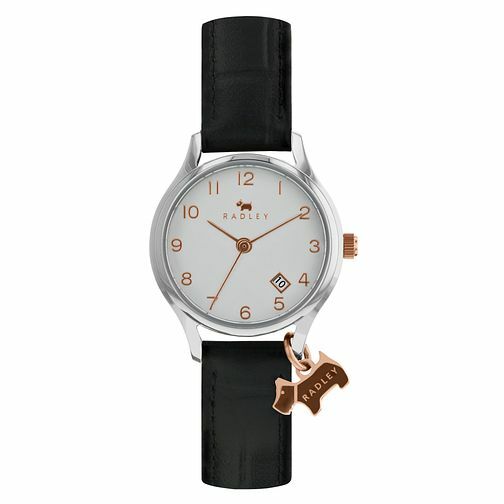 Radley Ladies' Black Leather Strap Watch is rated 4.0 out of 5 by 1. Rated 4 out of 5 by Anonymous from Well made, lovely product Really nice watch. And great service from hsamuel.